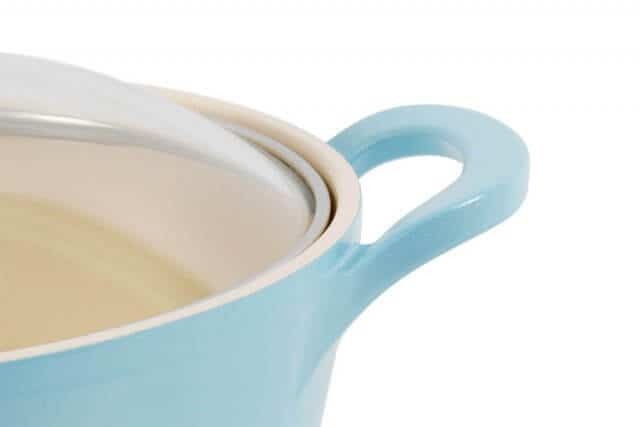 Learn about the PROs and CONs of the Neoflam Retro Ceramic Cookware, winner of the 2014 Red Dot Design Award. Neoflam is made in Korea. We’ve been testing this set in our kitchen for the past 2 months. I waited until now to post this review because I really wanted to put the set through a thorough test, with heavy daily use. 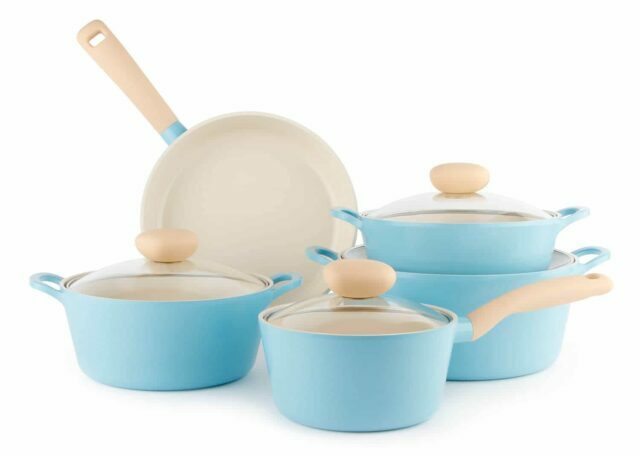 This simply is the most beautiful set of cookware! In addition to the soft blue (even though Neoflam calls the blue “mint” it’s more of a tasteful blue-grey), there’s a pink and grey set as well. The colors are matte and muted. We previously reviewed the Neoflam Wok and I stated that it’s so pretty that it sits on my stovetop even when not in use. The design is clean, soft with seamless lines, curved handles and a knobby lid handle that I’ll talk about later. 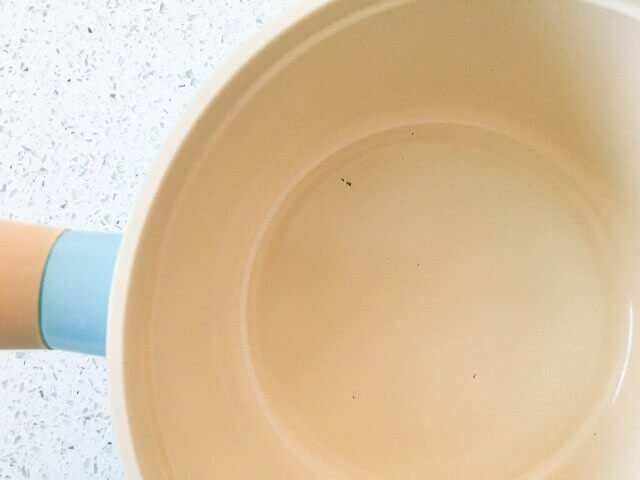 The large pots have no rivets to collect grease and food. Rivets are notoriously hard to clean. Because the Neoflam set is cast aluminum (it’s created as one piece in a cast mold), the handle and pot is one piece. Glass lids are a must in my kitchen! I can see what’s going on in the pot without opening the lid. The knob has a built-in steam vent. This is one of my favorite features. Normally, I have to prop the lid up or skew the lid to prevent liquids from boiling over, or to let some steam escape (which help me regulate rate of evaporation of the sauce/liquid). The knob stays cool (with the exception of the steam vent). 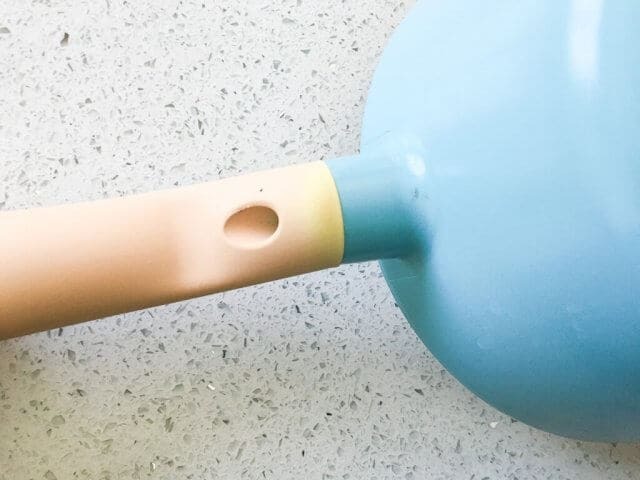 Since the knob is so large, and ergonomically shaped, it’s easy to grab without a mitt or towel, will not slip (it’s made of some kind of grippy-ish plastic). Included in the package are two silicone grips that you just slide right on to the handles. The entire pot gets hot, including the handles. 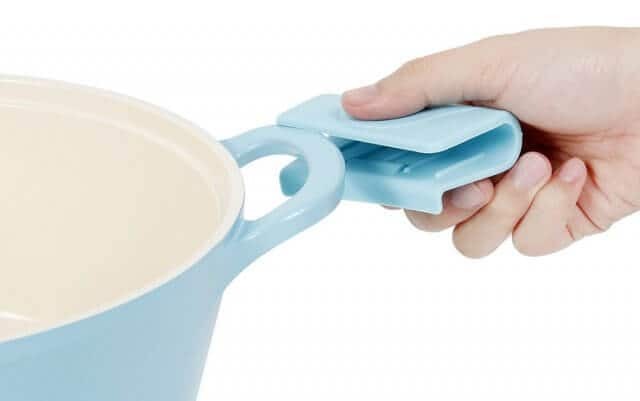 Leave the silicone grips off until you need to move the pot. If you keep the grips on while the pot is on the stove, the silicone will get too hot to handle. The Ecolon is made from silicone and minerals, no harmful chemicals. 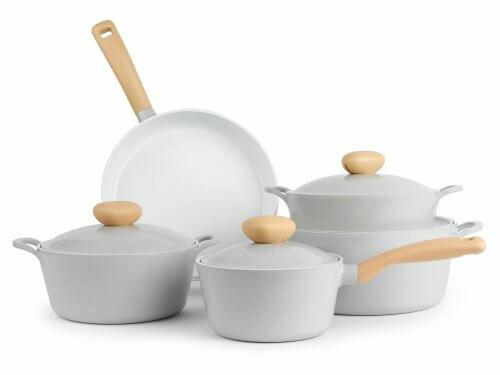 I like nonstick cookware….it’s easy to cook with, easy to clean. 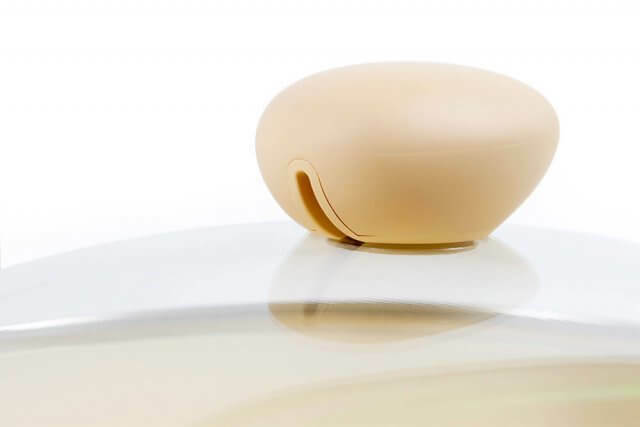 Eggs slide right off with minimal oil. There’s a YouTube video of someone cooking eggs and the eggs stuck to the pan. My guess is that that person didn’t use any oil whatsoever. I’ve NEVER had any problem with food sticking, as long as I use a tiny bit of oil or spray a bit of oil on the pan. Because the core of the pans are made from aluminum, and then coated with the Ecolon, the pans heat up VERY fast. Instead of pre-heating a regular pan for 1-2 minutes, the Neoflam is ready in 15 seconds to use. Electric and gas friendly. While I love my heavy duty cast iron, tri-ply copper bottomed pots and pans, they are heavy and put strain on my wrists. The Neoflam is so light – easy to lift, wash, cook with. Also, all the pots and pans are really easy to clean – no need to use the scrubby side of the sponge. This isn’t the pan for searing steaks. Because of the ceramic material, the manufacturer suggests low to medium heat cooking. So, it’s great for seafood, vegetables, I would even do chicken in this (the chicken breast browned really nicely). But if you want to make blacken chicken or get really good sear marks, use a different pan. I’m a high-heat cooker – and my stove is super powered with a gazillion BTUs, so sometimes it’s hard to control and tame the flame down. It hasn’t harmed the pot any, but you can see it discolored a bit at handle. The handle is fine, but just discolored. All the pots, pans and lids with light colored knobs and handles cannot be used in oven. You MUST be diligent with monitoring what utensils are used! Metal utensils scratch. I used a metal serving spoon once and scratched it a tiny bit. The included frying pan is really a saute pan. I’d love to have a pan with lower, sloping sides to make frying eggs easier. 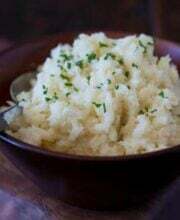 People who like to cook healthy, with minimal oil. 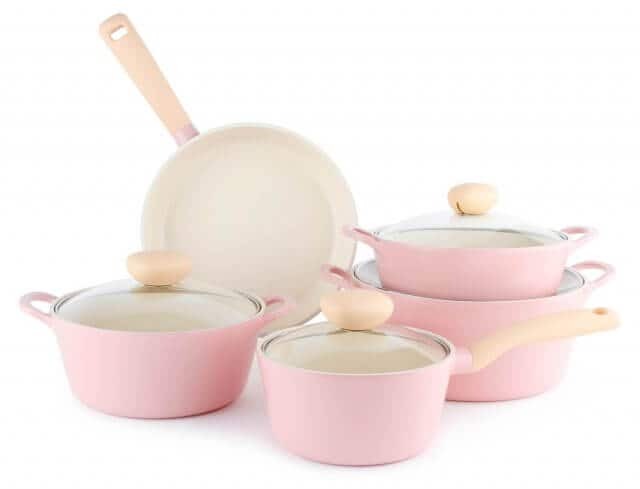 The set is great for cooking vegetables, eggs, seafood, chicken, pork (low to medium heat cooking). Because it’s so lightweight, this is a set that’s great for people who have weak or pain in arms or upper body. We’ve been using this set for 2 months straight. I like it so much because it’s easy to use, easy to clean. Very unfussy maintenance! When my kids cook, they always grab a pot from this set. If you also like to do high heat cooking, like searing steaks, get an additional cast-iron pan for that purpose. Make sure you use plastic, silicone or wood utensils.